“What’s the big fuss about baptism?” a friend asked me recently. “After all, I’m saved because of my faith in Jesus, not because I’ve gotten baptized.” It was a great question, and he was absolutely right. We’re saved “by grace alone, through faith alone”, and not by any external ritual, like baptism. If this is true, what then is the big fuss about baptism? Baptism is a public, physical symbol of an inward commitment to Christ as Savior and Lord. Baptism by immersion, then, is a vivid illustration of what happens spiritually when we become Christians, and enter the believing community. When we are submerged under water, it’s a picture of our being united to Christ in his death. Just as Jesus died, suffering God’s punishment for our sin, so we “die” to a whole way of living—we quit relying on ourselves as Savior and quit allowing ourselves to be Lord. Likewise, just as Jesus rose from the dead, so too we are “born again”, through faith in Christ, to a whole new way of life—a life where we rely on Jesus alone as Savior, and follow Jesus alone as Lord (Romans 6:4). Baptism is actually commanded in the Bible (Acts 2:36-39), and for good reason. When you not only place your faith in Christ, but celebrate that commitment publicly, God is glorified, the church is encouraged, and the community witness a demonstration of God’s saving power! 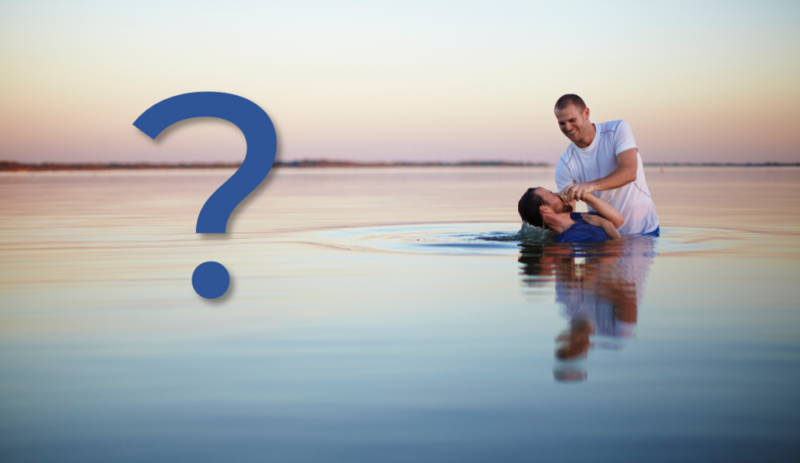 You are ready to be baptized if you can answer “yes” to two key questions. The first is, “Have you placed your faith in Christ as Savior?” That is, have you turned away from trusting in yourself, and leaning on anything in your life—your good deeds, good intentions, your church involvement, your Christian upbringing—for the assurance that you are “right” with God, and have you instead placed your confidence fully in Christ’s work on your behalf? The second question is, “Do you desire to follow Christ as Lord?” That is, are you willing to submit as much as you know of yourself, to as much of you know of Christ? Is it your desire to humbly allow Christ to climb into the cockpit in your life and start calling the shots? Will his desires, plans, and priorities for your life become your desires, plans, and priorities for your life? This is what it means, functionally, to make Christ the “Lord” of your life. You need to be able to answer “yes” to both of these two questions in order to be baptized. However, these are the only two questions you need to be able to answer “yes” to! If you are ready to be baptized, contact any pastor at church, or office@nscbc.org. If you’re still thinking about the two questions above, I’d encourage you not to walk the journey alone. Get together with a pastor, your Small Group Leader, or even a good Christian friend, and share with them what you think is holding you back from answering “yes”. We would love to walk with you in your journey to faith in Christ!